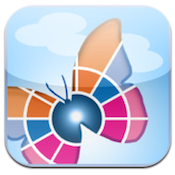 AccessToGo is an iPad app developed by Ericom Software. This Remote Desktop/RDP Client proclaims itself to be “the FASTEST mobile RDP client on the market.” Does AccessToGo live up to its own self-created hype, or will it collapse in on itself under so many high expectations? In my opinion, AccessToGo absolutely lives up to the hype! But there are some issues you should be aware of. However, I was pleasantly surprised to learn the app supported sound / audio redirection to the device from a remote computer. 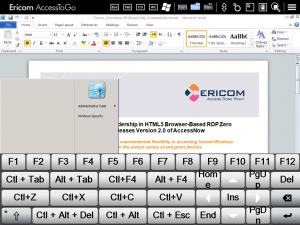 AccessToGo is the only mobile RDP client that supports both touchpad and floating pointers. It works at blazing-fast speeds, and I was really impressed with both the speed and overall quality of the app experience. 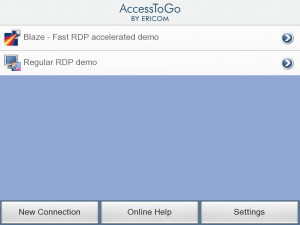 AccessToGo is super fast, very easy to navigate, and a solid all-around app. 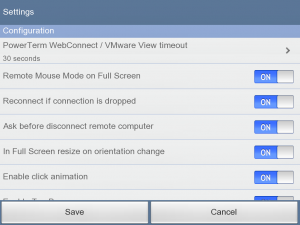 Yes, there are some limitations, but what mobile desktop app doesn’t have some limitations? With highly accurate screen control and awesomely intuitive controls, I honestly couldn’t ask for much more. 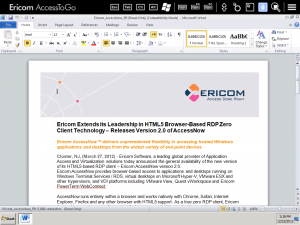 If you need an iPad-friendly RDP client, AccessToGo comes highly recommended. After all, Ericom Software does have some pretty great customer support. AccessToGois compatible with iPhone 3GS, iPhone 4, iPhone 4S, iPhone 5, iPod touch (3rd generation), iPod touch (4th generation), iPod touch (5th generation) and iPad. Requires iOS 4.3 or later.